From 2012 to 2014 I will be walking the South West Coast Path which runs from Minehead in Somerset to Poole in Dorset. The 630 mile trail contours its way through four counties, has 115,000 feet of ascent (and descent) and should take about 60 days. I will complete the walk in one week blocks with two or three week breaks back in the studio. 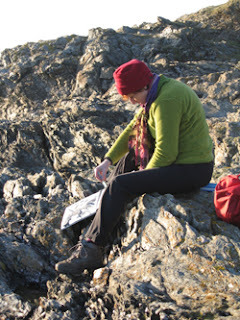 I will be sketching en-route and aim to produce a drypoint plate for each day of the walk. This will result in a body of work made up of about 60 drypoints expressing my response to the landscape. 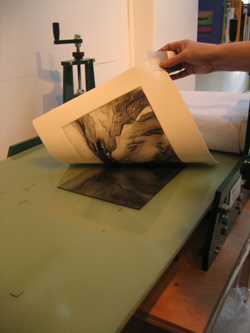 A drypoint print is made by scratching into an acetate sheet using a sharp point. Printing ink is applied to the plate which is then put through an etching press to transfer the image onto paper. Once the prints are complete I aim to tour them, with additional larger works, around selected South West galleries. 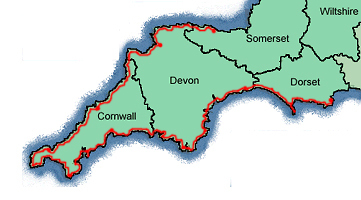 An exhibition of work from the first half of the walk (Minehead to Penzance) took place at the Devon Guild of Craftsmen in early 2013 and again at Harbour House, Kingsbridge in September. Selected works were also exhibited at the Cotehele National Trust Gallery in the middle of the year. The first exhibition of work from the second half will take place at the Devon Guild from 25 September to 16 November 2014.